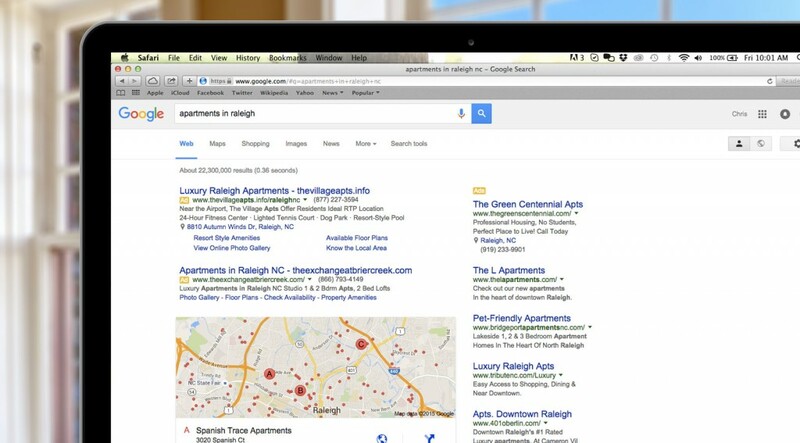 How Do Apartment PPC Ads Stack Up Against Internet Listing Services? For the past several years, marketers in the apartment industry have relied on Internet Listing Services to advertise their communities. But as more and more studies reveal the power of PPC campaigns, many industry pros are rethinking their apartment marketing strategies and retooling their advertising arsenal. To give you a breakdown of how the PPC differs from your ILS, we’ve answered some frequently asked questions so that you can decide which approach is best for you. PPC, or Pay-Per-Click, is an internet advertising model in which advertisers only pay for ads when they are clicked. The cost for each of these clicks is determined by an automated bidding system, where advertisers set the maximum price they’re willing to pay for each bid and only have to outbid the competition in order to place an ad. Oftentimes, what the advertiser pays is less than the maximum bid. On search engines like Google, users see PPC ads based on that user’s search phrase. For example, if the search phrase “Apartments in Philadelphia” is entered into Google, apartment companies with communities in Philadelphia will increase the price they’re willing to pay for a click in order to maximize their visibility to the user. Where do PPC Ads Appear in Search? Unlike coveted “organic” listings, which cannot be purchased because they’re naturally selected by Google’s proprietary algorithm, it’s relatively easy to buy top PPC ads in Google. And because the top performing paid listings appear above the organic listings, PPC ads are a great way to increase your listing’s visibility in Google. Although PPC ads guarantee a listing that’s distinguishable from organic results, it should be noted that other factors determine the ads overall placement. Ads that offer a higher bid price, for example, will likely appear above ads that offer a lower bid price. What Advantages Do PPC Ads Have Over Internet Listing Services? PPC ads are superior to your typical ILS in two ways. The first way concerns overall user experience. And the second way concerns how Internet Listing Services can sometimes direct the user to a competing listing, from your ad! Regarding user experience, online marketing professionals unanimously agree that it’s best to get lead prospects to your landing pages as quickly as possible. And successful PPC ads are guaranteed to deliver search engine users to your property pages quicker than Internet Listing Services. To understand why this is the case, consider an instance when a Google search for “Pet-friendly apartments in Philadelphia” returns both a PPC ad result and an ILS result. If the user clicks on the ILS result, he or she is transported to a category page that displays all pet-friendly Philadelphia property listings that have a contract with the ILS. The user must then click again to see a single property’s page. This is vastly different from PPC ads, which transport users directly to your website. Regarding the second way in which PPC ads are superior to Internet Listing Services, you have to think about the overall design of a typical ILS. Not only do most ILS landing pages immediately confront each user with an array of property options, most also display competing properties on your community’s designated page under the “Similar Listings” section! Are PPC Ads as Easy to Use as Internet Listing Services? While the advantages of PPC ads are quite clear, ease-of-use is one thing that prevents most apartment marketing professionals from using them. Thanks to our new PPC packages, however, this should no longer be a problem. PPC ad management services from Respage allow apartment marketing professionals to establish an effective campaign that’s as easy and hassle-free as an ILS. We do all the legwork by collecting basic property information, identifying keywords, setting up campaigns, and creating ads for each apartment community. Clients can monitor the progress of their campaigns 24/7 through the Respage Dashboard, which provides full transparency on your ad’s impressions, average cost per click, click-through-rate, and more!